This is how you beat level 304 of Candy Crush Saga. Follow these Candy Crush cheats, tips and strategy and you will pass level 304 in no time! The goal of level 304 is to get 60 striped candies in 50 moves and get at least 60,000 points. With 60 striped candies to collect and only 50 moves, you can’t afford to move carelessly in this level. Making a striped candy usually takes two turns to set up and detonate, so that might not be your best approach. Instead, rely on the plethora of mystery candies that this level has set for you. Chances are, you will reveal a healthy amount of striped candies. 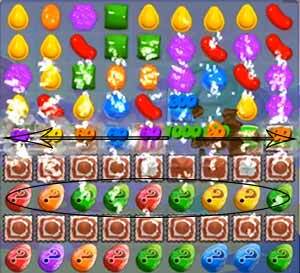 Success in this level requires you to mix striped candies and color bombs multiple times. When you make this combination, all of the colors that correspond to the striped candy will automatically become striped candies themselves. This is a HUGE help in this level. Make sure to count the color of the striped candy you use for the best results. Don’t be afraid to reset the board. This is a really challenging level, even if you’ve played it right. For every move you make that doesn’t result in a striped candy, you dig yourself deeper into a hole.